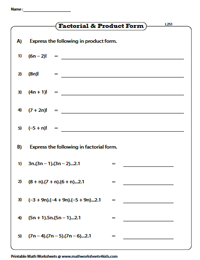 Factorial worksheets benefit high school students to test their understanding of factorial concepts like writing factorial in product form and vice versa; evaluating factorial, simplifying factorial expressions, solving factorial equation and more. 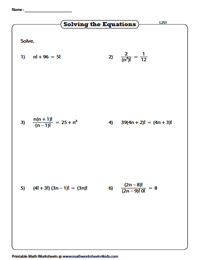 Additionally, MCQ worksheets are provided to reinforce the concept. Factorial worksheets are divided into two parts. Part-A requires students to express the factorial in product form and Part-B is vice-versa. Level 2 raises the bar by introducing variables. Part-A requires students to write the factorial of an algebraic expression in general form & Part-B is the other way around. Each worksheet is divided into two sections. In Part A, express the given factorial in terms of specified factorial form. In Part B, write the numerals in factorial form. 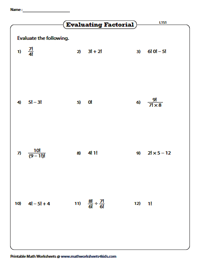 These factorial worksheets contain basic arithmetic operations and require students to simplify the numerical expression involving factorials. 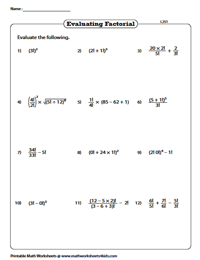 Level 2 worksheets comprise more complex factorial expressions, including exponents and square roots. Evaluate the expressions. Simplify the algebraic expressions that involve factorials. Six problems are given in each worksheet. Write the factorials in general form, isolate the variable and solve the equations involving factorials. Use the answer key to verify your solutions. 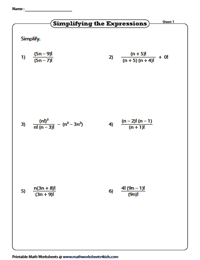 The level 2 worksheets offer a more complex factorial equation where students need to find the value of the variable. 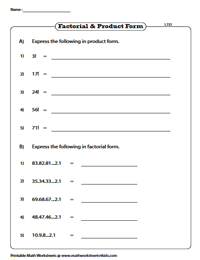 These factorial worksheets combine all the aspects of factorials to reinforce the student's knowledge on factorials.